Seed the aggregate onto the surfaceThe most commonly used method is to seed the decorative aggregate onto the slab surface immediately after the concrete has been placed, struck off, and bull floated. This involves sprinkling the aggregate by hand or shovel uniformly onto the surface and then embedding it with a bull float or darby until it's completely covered by a thin layer of cement paste. Mix the aggregate into the concreteYou can also have the ready-mix producer put the decorative aggregate right into the concrete mix during batching, which eliminates the step of seeding it onto the surface after concrete placement. However, depending on the cost of the aggregate you choose, this method can be more expensive than seeding because it requires using greater quantities of decorative aggregate. 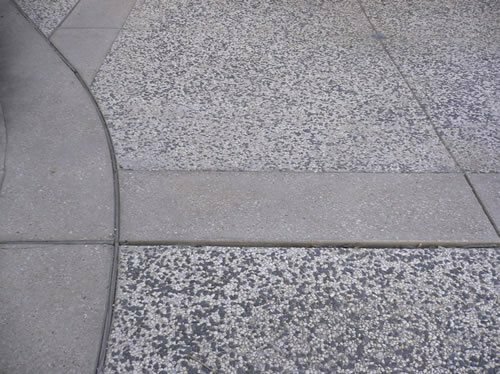 Put the aggregate into a thin toppingAnother alternative is to place a thin topping course of concrete containing the decorative aggregate over a base slab of conventional concrete. The topping can range in thickness from 1 to 2 inches, depending on the aggregate size. This method generally works best when smaller decorative aggregates are specified.